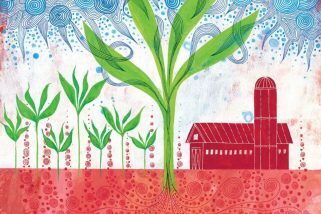 Center for Food Safety’s Diana Donlon talks with Bill Resnick of KBOO about the importance of soil health in addressing the climate crisis. Climate One host Greg Dalton went to the climate summit in Paris to learn what food and energy solutions were being proposed – outside of the closed door negotiations. He came back with food for thought. AG Kawamura, CA Secretary of Food and Agriculture under Gov Schwarzenegger. Center for Food Safety’s Diana Donlon talked with KFCF’s Angela Price about the importance of healthy soil. It stores water, improves food yields and sequesters carbon. The host really knew very little on the subject and thought that perhaps she’s not the only one! The meat industry has been much maligned for its part in climate change. But can raising cattle in pastures help turn global warming into global greening?